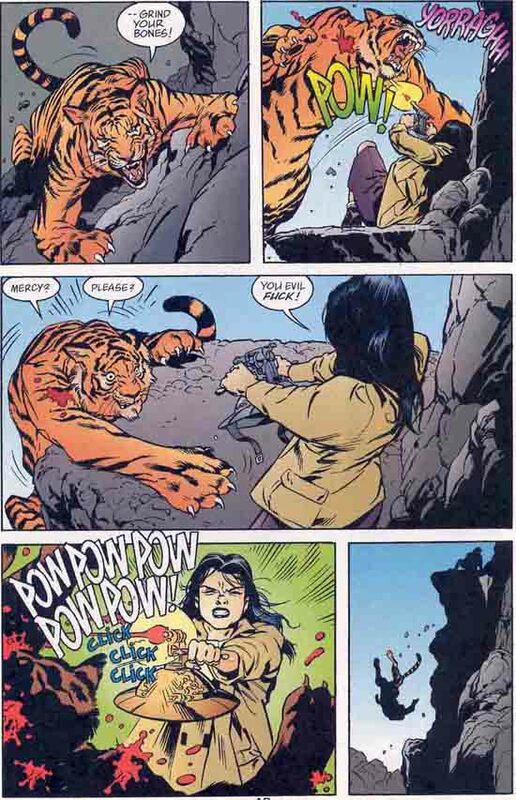 The idea that the writer of FABLES had, was simple... thankfully it wasn't a simplistic one. If superhero comics are the modern mythology, then why shouldn't someone turn to the historically older myths? Only, he would put a modern spin to them, setting them in the present and absolving them of all the stereotypes of folk tales. The heroes of the fairytales we all loved as children, co-exist in a comic book and Bill Willingham seems as overwhelmed by the concept as his readers. Comicdom: How did you conceive the idea of FABLES? Bill Willingham: I'd been closing in on the idea for several years. Fairy tale and folklore characters kept showing up in my other work. Even in my very early superhero series ELEMENTALS, I kept doing stories involving folklore characters. I suppose it was just a matter of time before I eventually designed a series specifically around the fairy tale and folklore characters (and a few beloved literary characters) who wouldnt stay out of my other work. Specifically I started by designing a series centered around a group of magical characters living in an underground community in New York. In my initial plans I thought they were going to be a group of refugee Greek gods from the Olympian pantheon. But the Olympian characters have been somewhat overused in comic books, so I started looking around to see what other groups of characters might be interesting to use. At some point it occurred to me to use well-known fairy tale characters and the rest just fell into place quickly after that thought occurred to me. CD: How did you sell the concept of the book to Vertigo? What was essentially your pitch for the book and what were the initial reactions you received from the editors? BW: Interestingly enough I didnt think FABLES was the type of series that would appeal to the Vertigo editors, so I wasn't even going to offer it to them. But I happened to mention it during a conversation with my Vertigo editor, Shelly Bond, when we were talking about another project, and she insisted I propose the series to them first. Vertigo agreed they wanted to do FABLES, almost as soon as they got the proposal. I suppose it helped that Jeanette Kahn was still at DC at the time and immediately loved the idea, thinking it would be an easy sell to be made into a movie - someday. At first there was some talk from Vertigo that we should try FABLES out as a miniseries first, just to see if there would really be some reader interest, but I dug my heels in, just a bit, and insisted that we launch an ongoing series or nothing. That wasn't a big deal though. I think the miniseries was just one of the ideas floating around at the time. CD: Is FABLES an open-ended story, or does it have a clear and precise end which you have already decided upon? BW: Both, actually. FABLES is an ongoing series, which I hope to do as long as possible. I do however have the final story in mind (in broad strokes), should it ever come time to bring the series to a close. CD: How much of the plot in the book is done in advance? How far ahead are you usually planning your stories? BW: In broad strokes, I plan the series years in advance. In specifics I generally plan the series two or three story arcs ahead - a story arc being one of the multi-issue stories, such as the current "Homelands" story, or the previous "March Of The Wooden Soldiers", and so on. CD: I find the idea of using fairytale characters in a comic book exceptionally "obvious" concept-wise. Why do you think it hadnt been used much till now? BW: Im not sure. Fairy tale characters were being used often in other media. There was a miniseries on TV (called the TWELFTH KINGDOM, if I recall correctly) which had similar ideas. INTO THE WOODS was a popular Broadway musical. Now there are plenty of comics using fairy tale characters. I doubt they all jumped on the FABLES bandwagon. Sometimes the ideas are just in the air at one time and many grab them at once. CD: Did you have to do extensive research for FABLES? Did you come upon any contradicting elements in any of the myths and if you did, how did you handle it? BW: I do extensive research only to the extent that I have always loved reading fairy tales and folklore and now have a good excuse to fully indulge those desires. I now no longer feel guilty reading fairy tales and such when I should be working, because now it is part of my job. Almost every tale has several versions. Some of them have hundreds of versions. That's the nature of folk tales. Folks keep fiddling with them and that is a very good thing. So, it's no surprise that some versions of a given tale contradict other versions. My job is basically to take the version I like best and see what new stories I can spin out of them. Basically I'm just one more folk, playing with folk tales, changing them to suit my whim. Many came before me and many will come long after me. CD: All the characters weve seen in the book so far are from western culture fairytales. Are you gonna use any from eastern stories (1001 ARABIAN NIGHTS), or maybe any characters from Mythology? BW: Im trying to shy away from formal mythology -I dont expect Zeus or other gods to show up anytime soon- but that is not a hard and fast rule. 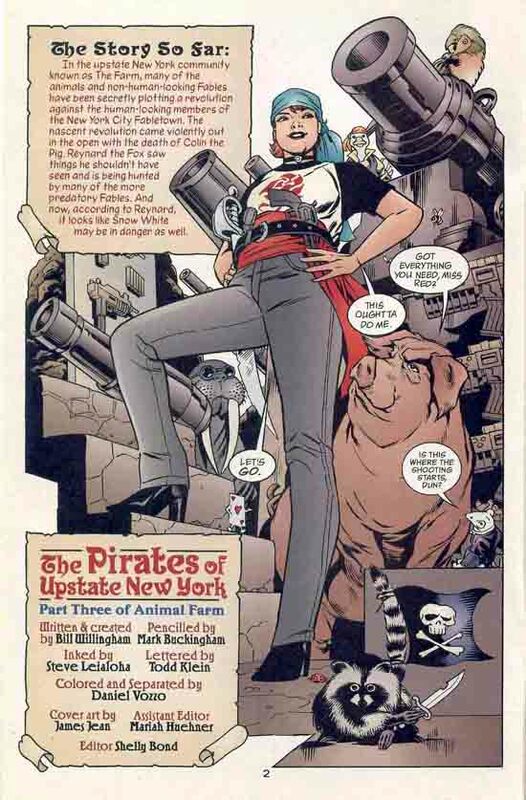 My only hard and fast rule where the FABLES series is concerned is that the characters I want to use are interesting to me and in the public domain. Thats it. So, potentially, anyone might show up in this series. As a general rule I try to stay away from those characters that other comic book writers have staked out for themselves. 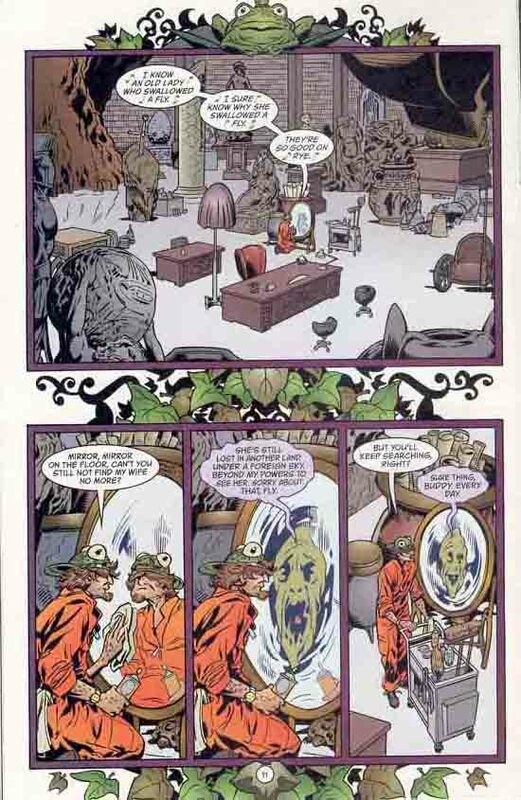 For example: I could use some of the same literary characters that Alan Moore uses in his wonderful LEAGUE OF EXTRAORDINARY GENTLEMEN, but why? He's already doing a great job with them. There are plenty of characters out there that haven't been explored yet. 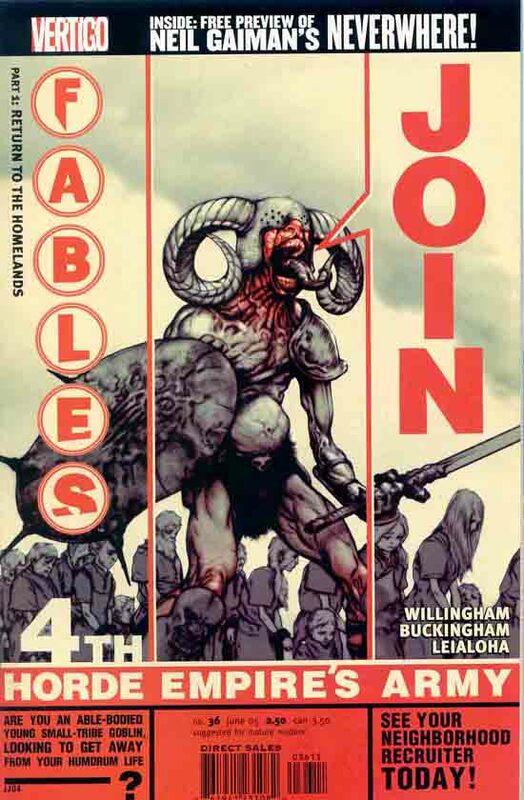 The ARABIAN NIGHT characters start showing up in FABLES, beginning with issue # 42, which kicks off the story arc called, coincidentally enough, "Arabian Nights (and Days)". 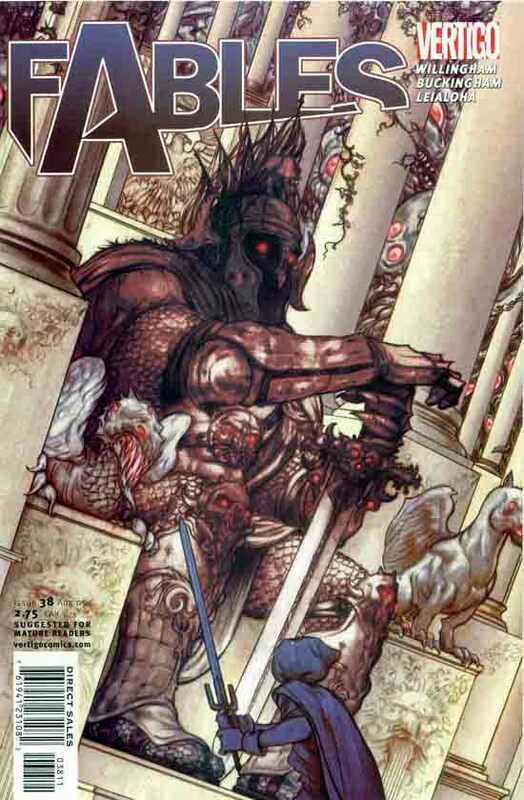 CD: How close do you feel that the characters in FABLES are to the superhero mythology? BW: They're close to superheroes in that many of the FABLES characters have supernatural powers and abilities far beyond those of mortal man. However, the Fables tend to be concerned most with not being noticed by the denizens of the mundane world. Superheroes, by contrast, tend to like to be noticed. Also the FABLES characters aren't trying to fight crime and save the world. Basically they just want to get on with their lives and maybe someday win back their homelands. CD: In my opinion (and I'm talking strictly as a reader here), the relationship between Bigby and Snow developed rather quickly compared to the -much slower- progress of the other characters. There was a time when the book seemed to be mainly about these two characters with all the other FABLES functioning as either supporting cast or -in extreme cases- set decorations. Are you planning on "retiring" the two characters in order to give the others more room to breathe? BW: Snow and Bigby did seem to take over the series for a time. Now theyve both been moved off-stage for awhile. Both will be back for future stories, but others will also have their moment in the spotlight. For example: Boy Blue is the obvious star of the "Homelands" story arc. 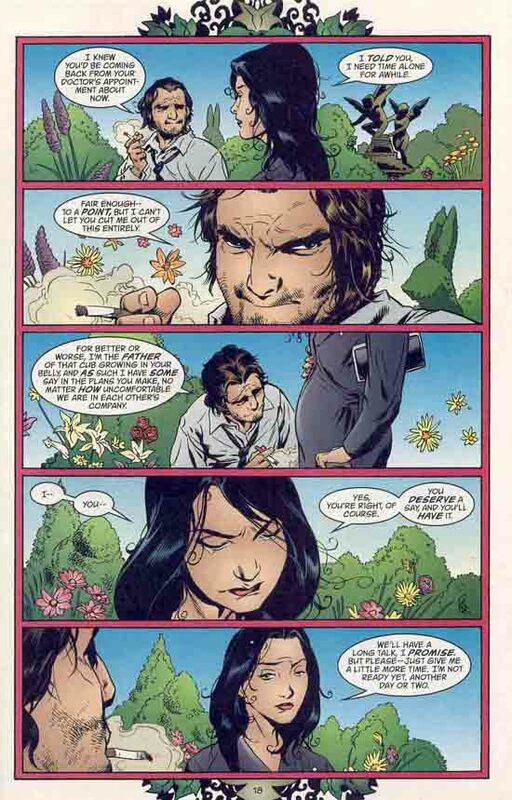 I doubt Ill ever formally retire Snow and Bigby, but they won't ever be the only star characters in FABLES again. There's room for many characters to take their turn in front. CD: I get the feeling that after the current storyline ends, the whole world in the book is going to be very different from the one we were used to. What can we expect in the following months from FABLES (and for the Fables)? BW: If we're doing it right, every major story changes the FABLES status quo. "Animal Farm" instituted major changes, some of which are still being felt today. "March Of The Wooden Soldiers" was the first time that The Adversary specifically attacked Fabletown and Fabletown will never be the same, now that they know they aren't necessarily safe there. The series is always changing, and I hope it always will. I'd hate to fall into a comfortable rut. CD: I believe Mark Buckingham has played an essential part in the success of FABLES (I think he's doing the best work of his career). Was Mark your choice or was it an editorial decision which you happened to agree with? BW: I agree that Mark is doing the best work of his career. He's even said so himself. Mark loves working on FABLES and has expressed a desire to keep doing so for the rest of his career. I hope that's so, because he is an artist of amazing talent and creativity. As far as how Mark came on board with FABLES: I knew about Mark's work in past years, but wasn't overly familiar with him or his work until Shelly Bond mentioned him as a candidate for illustrating a SANDMAN-related book I wrote called: MERV PUMPKINHEAD, AGENT OF DREAM. He did a wonderful job on that story and has had a standing invitation to work with me ever since. When Shelly mentioned hed become available in time to illustrate the second FABLES story, "Animal Farm", no other artists were considered. He had the job if he wanted it, and fortunately for all of us, he wanted it. CD: How much input do you allow others to have in your stories for the book? Do you plan things ahead with Shelly? Do you accept story ideas from Mark? BW: Yes, I accept ideas from others. For example, in addition to creating many wonderful background characters, like the angry Sunflower Kid, and the fat yellow bird, up at the Farm, Mark is the one who had the terrific idea that someone like Jack might someday try to increase his Fable power by getting a movie made about him. That became the two-part "Hollywood Jack" story that recently appeared. Unfortunately for Mark, that story ended up being one of the shorter stories we do, in order to give Mark the time to devote to the larger story arcs, so Mark didnt get to illustrate his own idea. 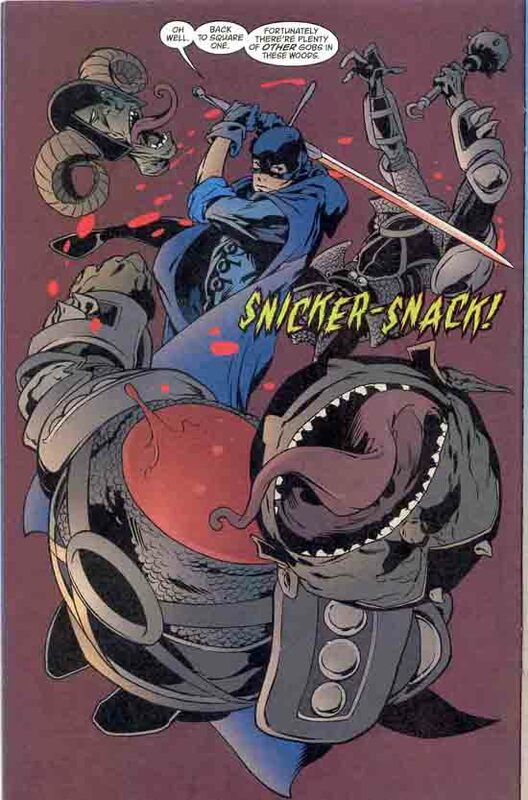 CD: Purely hypothetical question and I'm pretty sure there's no chance in Hell something like that will happen but I'll ask it anyway: How would you react if Shelly came to you and proposed a FABLES/BATMAN crossover? Or a FABLES/WITCHBLADE crossover... or any other FABLES/WHOEVER crossover. Is there any particular case where youd see yourself agreeing to at least giving it a thought? BW: In my head I've played with the idea of doing a Bigby-Batman crossover, and I know exactly what that story would be. It would be fun to do such a thing and if I ever get far enough ahead on my work to fit it in, I may propose it to DC someday. CD: Are there any other spin-offs in the works? 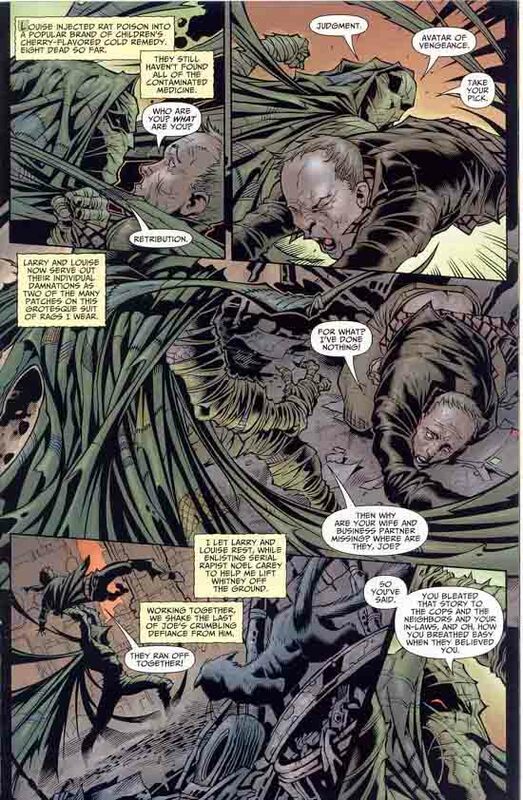 CD: Do you feel that your involvement in INFINITE CRISIS is taking time (and attention) off your work in FABLES? CD: Since we mentioned INFINITE CRISIS, let's talk (for just a short while - this is an interview about FABLES after all) about your part in the big crossover. The DAY OF VENGEANCE mini-series you're writing seems -on the surface- to be the "least important" or anyway, the least essential to the core story, spin-off. How much and in what ways is the story interwoven to the "bigger picture"? 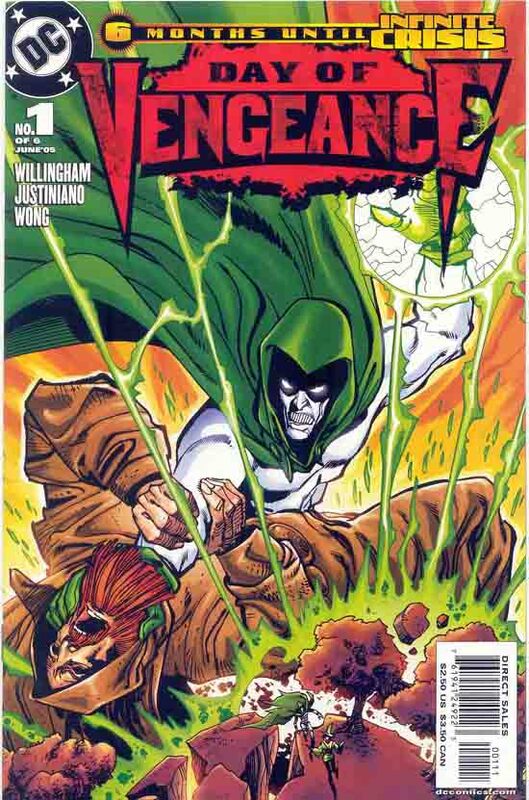 BW: I don't consider DAY OF VENGEANCE to be the least important miniseries, leading up to the INFINITE CRISIS series. You'll just have to pick up the INFINITE CRISIS series to see if I'm right. DAY OF VENGEANCE provided me the profound responsibility of recasting and redefining the magic corner of the DC Universe and I am humbled and honored that they would trust me with helping to map out the future of nearly a quarter of the sprawling DCU. CD: How did you react when DC asked to do DAY OF VENGEANCE and how much of it is "your thing", as opposed to being pretty much pre-decided by the decision-makers? BW: I was pleased to do it when they offered it to me. Most of the big events in the series were already decided, before they asked me to write it. I got to choose the characters who would make up the new Shadowpact team, and I got to figure out how to make happen what they needed to have happen, in order for DAY OF VENGEANCE to lead into the events of the INFINITE CRISIS. Most of the character stuff is mine. CD: How do you manage to keep track of INFINITE CRISIS continuity? Are there any idea meetings between the participating writers or are you just given the basic plotlines by the editors? BW: We make lots and lots of phone calls. And, yes, we all contribute ideas. CD: What other projects (not related to either FABLES and CRISIS) are we going to see from you in the near future? BW: In the next two years I'll be doing quite a few things with the DCU, a new miniseries or two and perhaps even a new ongoing series. I wish I could give you details, but I can't. But look for specific announcements soon.